These cookies are just fun and festive. You can let your imagination run wild as you make these cookies. Red and green swirls, white and green swirls with multi-colored sprinkles, plain white swirls with sprinkles in between… my mind is racing with the possibilities. Keep in mind you could also change the colors up for pretty much any holiday. Another great thing about these cookies is that you can make a roll, keep it tightly wrapped in the freezer and pull it out if you have unexpected company and need a quick dessert. Another typically store-bought convenience item made from scratch. I love it! On top of all of that, you can also use a variety of mix-ins. Deb, from Smitten Kitchen, has a list of different mix-ins you can try. I wanted to keep mine simple and festive, so I left out the mix-ins and went for a strong almond flavor. In the bowl of a standing mixer, beat butter until light and smooth. Add the sifted confectioners’ sugar and beat until smooth. Add the egg yolks, salt, and extracts and mix until combined. Add the flour and mix just until combined, be very careful to not over mix. 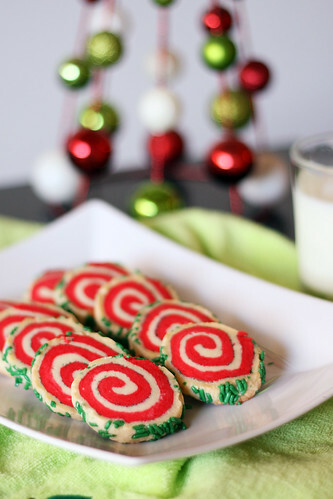 To make a 2 color swirl, divide the dough in 2 and color each half as desired. Shape each half of the dough into a ball, wrap in saran wrap and chill for 20-30 minutes. After chilling roll half of the dough, on top of a piece of parchment paper, to 1/8-1/4-inch thick. Roll the other half of the dough the same way. 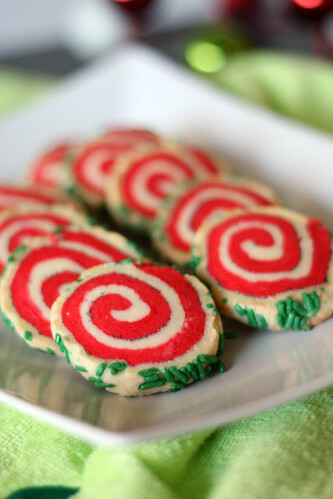 Carefully flip the dough you want on the inside of the swirl on top of the dough you want on the outside of the cookie (option to sprinkle the first layer with sprinkles before placing the second layer). Remove the top sheet of parchment paper. Roll the stacked dough into a log, using the bottom sheet of parchment paper to keep the log even. 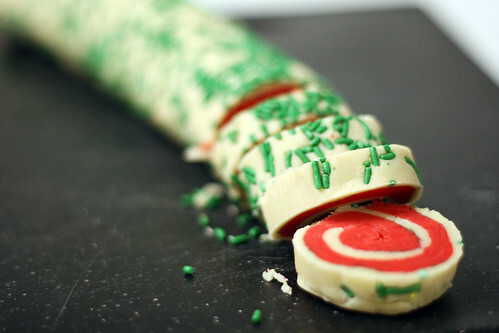 Once it’s shaped, you can roll the outside of the log in your choice of sprinkles. Wrap the log in saran wrap and place in the fridge for 2 hours or overnight. You can also double wrap it with aluminum foil and freeze it for up to a month. While the dough is chilling, preheat the oven to 350 degrees. 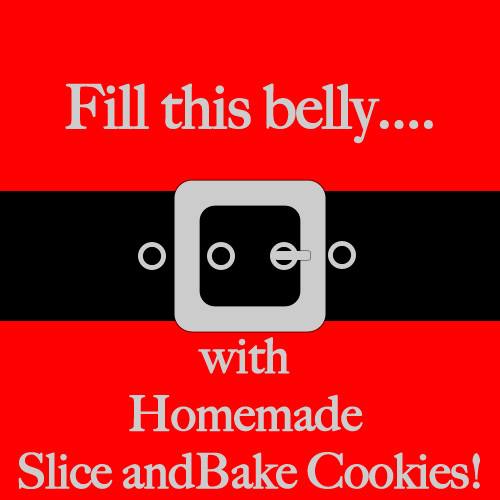 Remove the log from the fridge and use a sharp knife to cut into 1/3-inch cookies. 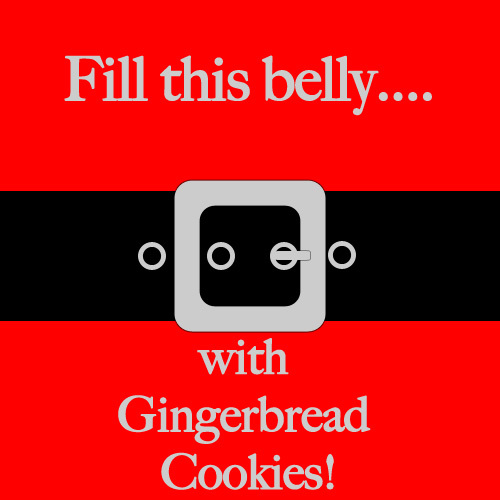 Place the cookies on a parchment paper lined cookie sheet. Bake for 12 to 14 minutes. I am really excited about day 3 of my week of Christmas cookies. First, it’s another traditional Christmas cookie. Possibly even THE Christmas cookie. 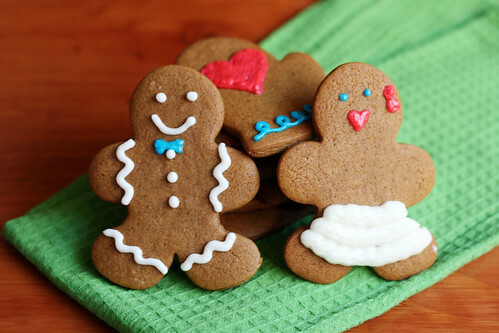 Who doesn’t think of Gingerbread men when they think of Christmas cookies? Second, they are just fun. 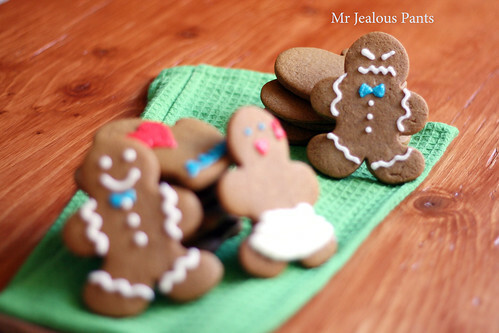 My Gingerbread men especially had a lot of fun during their photo shoot… up until the end…. And in case you’re not into the destruction of Gingerpeople, you can make something more delicate, like mittens. As for the recipe, I think it hits the nail on the head. Thick, chewy, and spicy. To the bowl of a food processor, add the flour, brown sugar, cinnamon, ginger, cloves, salt, and baking soda. Run for about 20 seconds, until well combined, then give a few 3 second pulses. Add the chunks of butter and process for another 20 seconds, until it starts to resemble sand. Turn the processor on and stream in the molasses and milk. Process for 1 minute or until it starts to form a dough ball. Turn the dough ball out onto a floured surface. Knead a few times with your hands to make sure it all sticks together. Divide the dough into 2 and roll each half between 2 pieces of parchment paper, until 1/4 inch thick. Stack the dough and place in the freezer for 20 minutes or the fridge for at least 2 hours (up to overnight) until the dough is very firm. Remove the dough from the fridge or freezer and gently loosen the parchment paper on both sides of the dough. 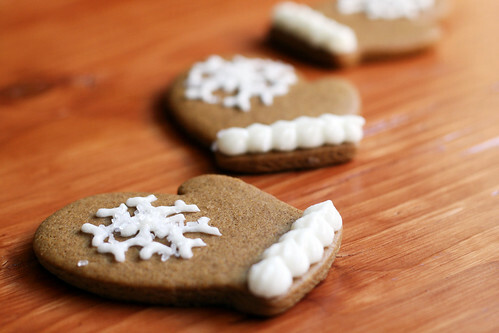 Remove the top piece of parchment paper and cut with cookie cutters. Place the cut cookies 1-inch apart on a a cookie sheet lined with parchment paper (use the top piece that you removed to be less wasteful!). Bake for 8-10 minutes or until you can barely see a finger print when you gently touch the tops of a cookie. Allow to cool for 2 minutes then move to a wire rack. Decorate with icing of your choice. Royal icing is a great choice if you want the design to last and harden. Buttercream or cream cheese are great for taste, but don’t stack well. It’s up to you! Day two of my week of cookies! 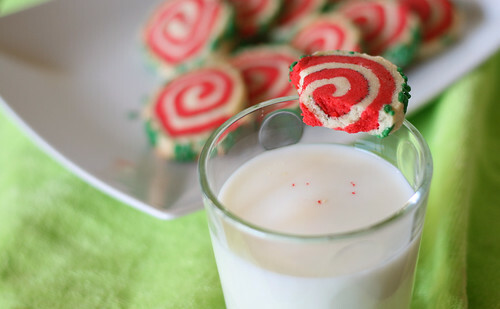 Today I bring you a classic Christmas cookie! I stumbled on this recipe probably 4 years ago and it quickly became a part of my yearly cookie baking tradition. It’s not super fancy, there are no surprising ingredients, it’s not exotic, it’s just classic. And that’s what I like about it. 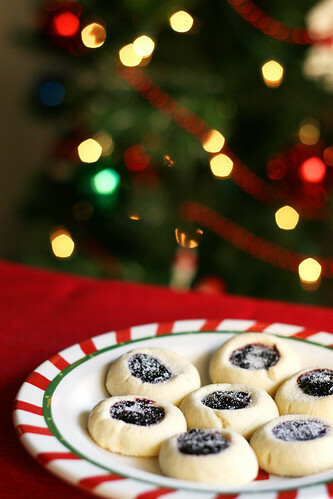 A soft, chewy cookie with a buttery shortbread flavor and of course, my favorite part, sweet and tangy black raspberry preserves. The saying is true, sometimes less is more! In a medium bowl cream together the butter and sugar. Add egg yolks and vanilla and beat until light and fluffy, just a few minutes. Add flour and salt, blend at low speed. If the dough is too soft to roll into a ball, chill for 30 minutes. 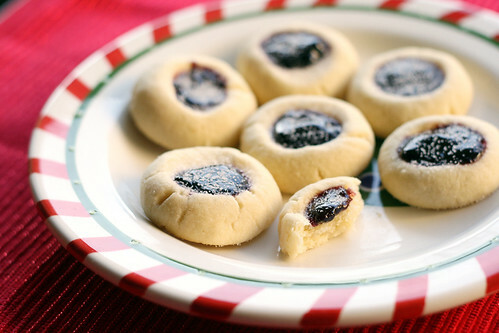 With floured hands, roll the dough into 1” balls (about 1 tablespoon of dough per cookie). Place cookies 2 inches apart on a baking sheet. 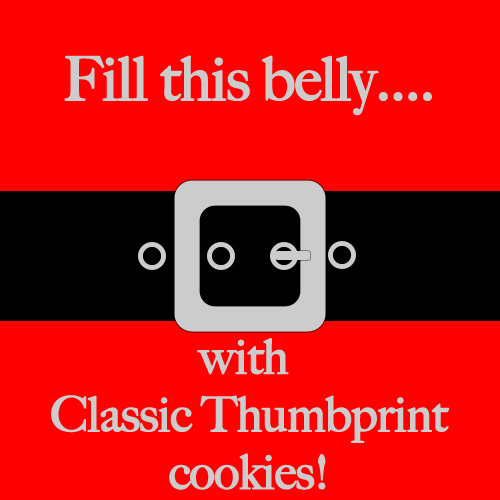 Press a thumbprint into the top of each cookie. 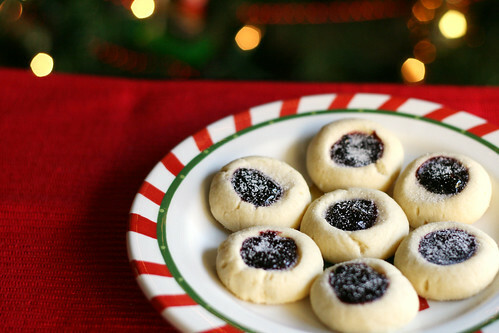 Fill the thumbprint with raspberry preserves. Bake for 15-18 minutes, the cookies will still look pale. Cool on racks and sprinkle with powdered sugar if you like. Makes about 4 dozen. If you’re still on the fence about how to prepare your turkey this weekend, then stop right here. This turkey doesn’t require any special bags or a sanitized cooler. Just a nice coating of salt and herbs and an overnight chill in the fridge. I’ve never brined a turkey, so it’s tough for me to give an honest comparison. But I can honestly tell you that with results like this, it’s unlikely that I ever will go through the trouble. This turkey is just too good. Combine all of the ingredients for the salt, set aside. Rinse the turkey inside and out, but do not pat dry. Coat the turkey inside (both cavities) and out. Use your fingers to loosen the skin over the breast and carefully rubs some of the salt under the skin. Place the turkey on a large plate (preferably with a lip to keep any loose juices on the plate and not on your fridge) and cover tightly with foil. Refrigerate for 24-48 hours. Adjust an oven rack to the lowest position and preheat the oven to 425 degrees. Rinse the turkey inside and out; pat very, very, dry (I also set it on top of a wad of paper towels for about 15 minutes). Rub some of the butter on the inside of cavities then divide the onion, celery, lemon, and herbs between the cavities. Truss the turkey (tie the legs together and wings in with cooking twine).Rub the rest of the butter on the outside of the turkey, getting under the breast skin as well. Place the turkey, breast side down, in a roasting pan, using extra carrots and celery to keep the turkey off the bottom of the pan if you don’t have a rack in your roasting pan. Pour the broth into the bottom of the pan. Roast at 425 for 45 minutes. Remove the turkey from the oven, then use wads of paper towels to flip the turkey breast side up. Reduce the oven to 350 degrees. Continue to roast turkey until an instant read thermometer inserted in the thickest part of the thigh reads 165 degrees, 1 1/2 – 2 1/2 hours longers (my 16 pound turkey took another 2 1/2, but keep an eye on it). 3 times during roasting, carefully baste the turkey with drippings and then quickly close the oven door again. 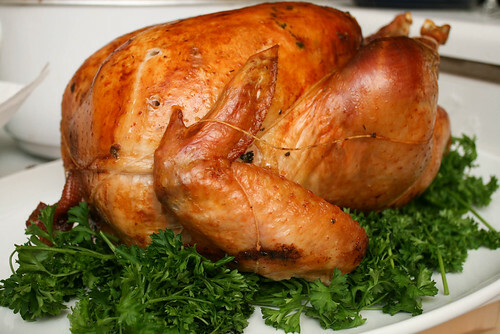 Tent the turkey with foil for 30-45 minutes before carving and serving. One last thing. The family I work for is out of town for Thanksgiving, and tonight as I was writing this post I got a text. 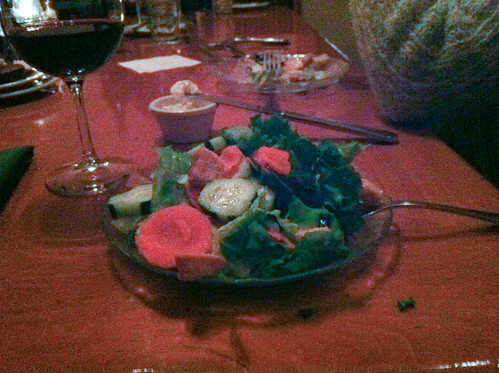 It was a picture of food that the youngest took. I told her I would put it on my blog so here it is. And can I just say I’ve taught her well? Look at that plate presentation (and no, that’s not her glass of wine).